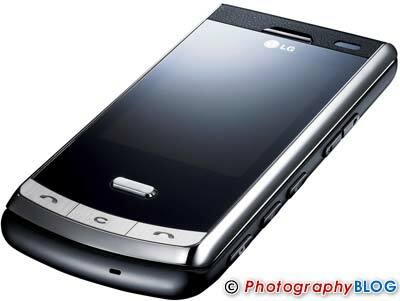 The LG Secret is a new 5 megapixel camera-phone that can also shoot DivX video at 120fps. At just 11.8mm thick, the LG Secret is the slimmest 5 megapixel camera phone on the market. Photo and video editing features include facial editing and SmartLight, a feature that automatically adjusts the picture’s light settings. After its European launch, the LG Secret will be launched in Asia and South America, followed by the rest of the world. The LG Secret will always look as new as the day of purchase thanks to the materials used to make it. Its casing of carbon fibre, one of the strongest composite materials used for aircraft and high-performance cars, adds to the handset’s durability. Its tempered glass LCD adds sheen and strength, as well as shielding the phone’s screen, and its neon touch navigation buttons sensitively respond to commands with a luminous blue light. As well as being the slimmest 5 megapixel camera phone, the LG Secret boasts the ability to take video at 120 frames per second and DivX® certified recording. Timeless moments can be edited with powerful photo and video editing features, including facial editing and SmartLight™, a feature that automatically adjusts the picture’s light settings. Users can also create their own music videos using the phone’s Movie Maker software. The LG Secret’s outstanding entertainment features take advantage of the phone’s touch-screen - users can access five multimedia functions which include music, photos, games, documents, and the FM radio. In addition, users can simultaneously flick through photos on the screen while listening to music. Microsoft documents can be opened easily and the handset is loaded with a Google package that enables the user to surf the Internet, log into Gmail, use Google Maps and watch YouTube videos. Using Bluetooth, the LG Secret automatically synchronises with PCs without the need to use USB cables. Images can be viewed both horizontally and vertically using the phone’s auto rotating display, and the screen’s lighting adjusts to ensure that it is always clear. In addition, the phone also comes with Voice Clarity technology that guarantees perfect sound quality in every environment. LG Electronics, Inc. (KSE: 066570.KS) is a global leader and technology innovator in consumer electronics, home appliances and mobile communications, employing more than 82,000 people working in over 110 operations including 81 subsidiaries around the world. With 2007 global sales of USD 44 billion, LG is comprised of four business units - Mobile Communications, Digital Appliance, Digital Display and Digital Media. LG is the world’s leading producer of mobile handsets, flat panel TVs, air conditioners, front-loading washing machines, optical storage products, DVD players and home theatre systems. For more information, please visit www.lge.com. LG Electronics Mobile Communications Company (LG) is a leading producer of UMTS (WCDMA), CDMA and GSM handsets. LG draws upon its cutting-edge technology and innovative handset design capabilities to create a higher quality mobile environment for its customers around the world. With a total range of wired and wireless solutions, LG is rapidly expanding its presence and market share in the global mobile industry. For more information, please visit www.lge.com.